CLOUD OR UFO? This photo taken by a New Plymouth man has hit the front page of an American UFO sightings website. A photo taken from a New Plymouth backyard has hit the front page of an American UFO website. Jim Paxie captured what he called "a most unusual cloud" but was surprised at the attention it gathered from extra-terrestrial enthusiasts in the United States. "I thought it looked more like a hamburger than a UFO," he said. UFO Sightings Daily publishes photos of suspected UFOs that are sent in from witnesses around the world and is viewed by tens of thousands each day. Mr Paxie said the photo was taken in the evening when the sky was lit with a pinkish tinge. "I just couldn't believe what I was seeing. A clear sky and just this one cloud." The strange cloud formation was just caused by the wind, he said. "But it was very eerie." 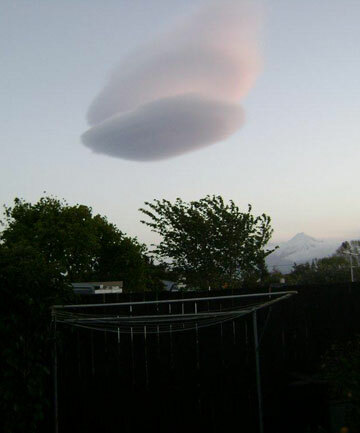 Mr Paxie's brother-in-law emailed the photo to the UFO sightings website where it was labelled "UFO Cloaked As Cloud Caught Over New Zealand". His brother-in-law had visited the US and had contacts in the UFO sightings community, Mr Paxie said. "He knows some funny people." The moderator of the website explains that UFOs sometimes create clouds around themselves in order to move in a stealthy manner.